A defiant Vijay Mallya, the fugitive liquor baron sought by India for defaulting on several bank loans amounting to nearly Rs 9,000 crore, on Thursday appeared before the Westminster Magistrates Court in London for the hearing in his extradition case. 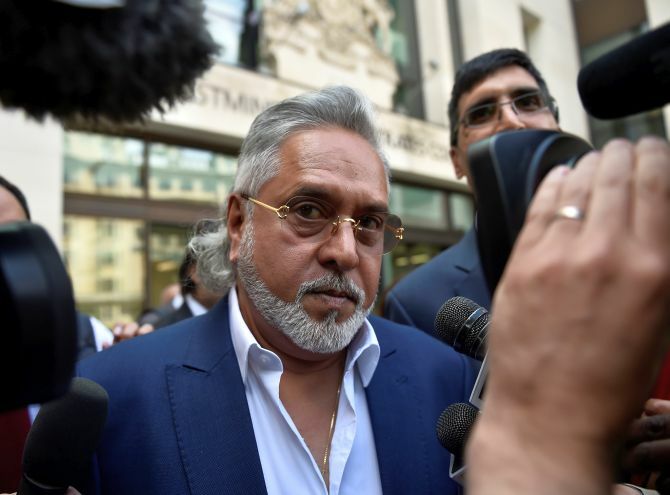 “I do as my lawyers advise,” the 61-year-old former chief of erstwhile Kingfisher airlines said when asked about his appearance despite being granted an exemption by Chief Magistrate Emma Louise Arbuthnot at last hearing on June 13. “This is a court. Let them present what evidence they have and we will present our case,” he told reporters outside the court house before the start of his hearing. Mallya was arrested by Scotland Yard in April and has been out on bail until December 4, the date tentatively fixed as the final hearing in the case. The Indian authorities believe their case is on a strong footing and all the evidence has been presented to the Crown Prosecution Service to argue India’s case for his extradition. “All documents and witness statements have been presented from the Indian side and the CPS is very happy with it. They are confident that all the evidence is in good order. So we are in good situation and all we hope is that the other side stop delaying,” official sources said. Mallya had been exempted from attending Thursday’s hearing after his defence team claimed he was “swarmed by media cameras” on his entry to the court last month. Barrister Ben Watson had urged the judge to impose barriers for the media outside the court for future hearings, to which the judge responded by excusing Mallya from the next court appearance while she looked into her authority to impose such barriers. CPS, represented by Aaron Watkins, had presented the case in court on behalf of the Indian authorities. Mallya’s defence wanted a final hearing date in March or April 2018, claiming they are yet to receive the “final evidence” from the Indian authorities and also believe a second extradition request is coming. The second request is believed to relate to the Enforcement Directorate’s case against Mallya. CPS had argued that the government of India will deal responsibly with any future extradition request and that a conclusion of the current case by December was preferable. The CPS had met a joint team of Central Bureau of Investigation and Enforcement Directorate officials in London in May to thrash out details of the case. Mallya, who is wanted in India for Kingfisher Airlines’ default on loans worth nearly Rs 9,000 crores, has been in the UK since March 2016 and was arrested by Scotland Yard on an extradition warrant on April 18. “I don’t make statements to the media because anything I say is twisted. There is enough evidence, that will speak,” Mallya had said in court last month. He had attended a central London police station for his arrest and was released on conditional bail a few hours later after providing a bail bond worth £650,000 (Rs 5.4 crore), assuring the court of abiding by all conditions associated with extradition proceedings, such as the surrender of his passport and a ban on him possessing any travel documents. If the Chief Magistrate rules in favour of extradition at the end of the trial, the UK home secretary must order Mallya’s extradition within two months of the appropriate day. India and the UK have an Extradition Treaty, signed in 1992, but so far only one extradition has taken place under the arrangement -- Samirbhai Vinubhai Patel, who was sent back to India last October to face trial in connection with his involvement in the post-Godhra riots of 2002. However, unlike Mallya, he had submitted to the extradition order without legal challenge. Did former PMO, finance minister bailout Vijay Mallya?